Upon your arrival, you’ll be picked up at Guiyang airport, and transferred to Kaili, the state capital of Qiandongnan Autonomous Prefecture. After check-in, the rest day is arranged at your will. In the evening you can go to the local market to experience the local life, and taste delicious Guizhou cuisine. [ Optional ] KuaiHuoLin/LiangHuanZhai: The most famous local dish in Kaili was Sour Soup Fish. This restaurant serves the best Sour Soup Fish Hotpot in Kaili. The fish and the soup are definitely tasty! 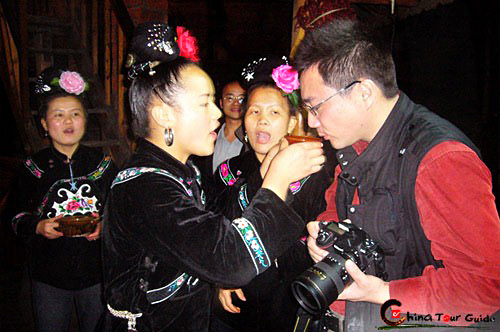 The KuaiHuoLin restaurant is decorated in the style of Miao ethnic architecture, all waitresses are Miao girls. Drive to Wangba Gejia Village to begin the interesting ethnic culture exploration. As a branch of Miao minority, Gejia people have distinctive costumes and dress-up, which looks quite vintage. Their unique guest-welcoming rite is worthy of your focus. Singing a song to welcome you, they will pour rice wine into bowls and then pour the bowls into your mouths. Once you had drank the rice wine, they stamped your faces with a small chop. In this old ceremony friendly Gejia people bless the visitors happiness and health. After lunch, shift to Jidao Miao Village to see those Miao women dressed in a styled long skirts. Get close to a local Miao family, chatting with them. As last, we have to back to Kaili for having a good night. Ancient Hand-made Paper in Shiqiao Village The tradition of hand-made paper is still kept in Shiqiao. Shiqiao Village of Danzhai County is one of the villages where villagers continue to earn their living by producing and selling hand-made papers and products. [ Optional ] Sunset Photo of Xijiang Village: At sunset, the mountain village looks brilliant. It is a good photo chance. The best position is the welcome pavilion at the entrance of village, where you have a bird eye view of the whole area. Visit Shidong Piantou Miao Village. Miao people is reputed for their silverwares. You'll find out how Miao people product it at a local silver workshop by lucky chance. Shift to One-Thousand-Household Miao Village of Xijiang, which boasts 1,200 families and 6,000 people and hence becomes the biggest Miao village in China. Check in and stay overnight at the hotel. The sunset and night views here are fantastic. Just enjoy. As one of the most important festivals of Miao minority, the Sisters' Meal Festival covers various meaningful ceremonies and interesting activities, such as bullfighting, cockfighting, Kungfu battle, singing and dancing competition and Miao silversmiths competition. Everyone dressed in their best shining costumes gathering at the square of village, and more than one thousand villagers will do drum dance together. The whole festival's biggest highlight is Miao girls' Beauty Contest. Sunset Photo of Xijiang Village At sunset, the mountain village looks brilliant. It is a good photo chance. The best position is the welcome pavilion at the entrance of village, where you have a bird eye view of the whole area. Paika village The PaiKa village is known for its manufacture of Lushengs, the characteristic musical instrument of the Miao. Visit the home of a Lusheng maker and know more about Lusheng-the Miao people's most important musical instrument. [ Optional ] Chejiang Dong Village: Dong village in CheJiang is famous lots of acitivities under dozens of Banyan trees. People are busy pounding the life out of some black (indigo-dyed) cloth with a heavy, wooden mallet. The pounding softens the cloth and then it into a shiny blue-black color. It takes hours and days of pounding to get the cloth soft and shiny. et up early for the awesome sunrise above the One-Thousand-Household Miao Village. 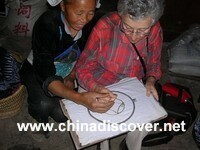 Then drive to Rongjiang and visit different Miao villages along the way. The first stop is Langde Shang Miao Village, a most picturesque Miao village in Kaili. 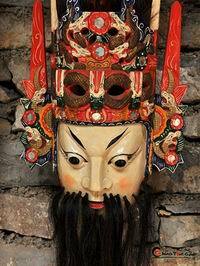 It is also known as the Miao's Ethnic Village Museum and will present visitors an authentic experience of Miao. Later visit Paika Miao Village to appreciate how the Lusheng is made. Lusheng is the Miao people's most important musical instrument. Then transfer to the famous Datang Short-Skirt Miao Village, where all the women wear extremely short skirts all year round. Another highlight in this village is the granary built over a pond with the multi-function of fire-proofing, rat-proofing and ant-proofing. After lunch, go ahead to visit Shiqiao Miao Village where you will have a unique chance to learn about the ancient paper-making technique. The last stop is Gaoyao Miao village to see the verdant rice terraces that blanket the hillside below the village. Stay overnight at the hotel in Ronjiang. [ Optional ] Dong Drama Performance: The opera troupes in Zhaoxing is well known for their folk drama. Their literary is abundant with narrative poems, pipa songs and epics. Usually the performance is hosted in a traditional drum tower at night. Today you'll move on to Zhaoxing from Rongjiang. 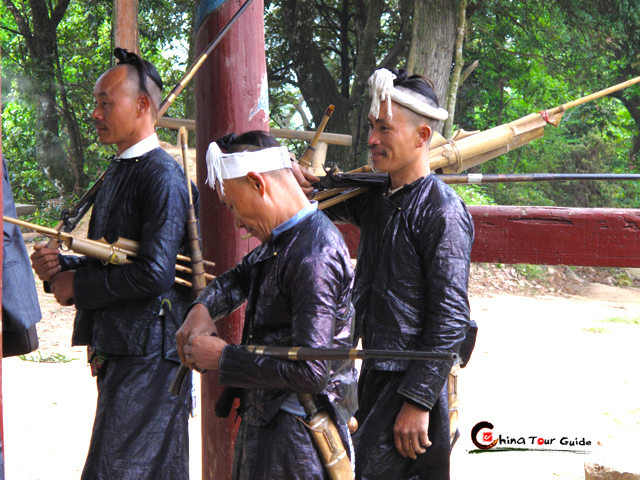 In the middle way, visit Basha Miao Village, which is reputed as the 'Last Gunmen's Tribe in China', for almost all the adult male villagers usually carry hunting guns on their shoulders and gunpowder bags, bullet bags and knives around their waists. Besides, the male villagers' distinctive hair dresses are known as the existing most ancient style in China. Reach Zhaoxing and check in at the hotel. [ Optional ] Flower Bridges in Zhaoxing: There are five bridges in Zhaoxing. Actually, the bridge is more of a building across the river, as most bridges are covered with pavilions. The bridges have earned the name "flower bridges" because of the exquisite sculptures that cover them. On a raining day, to sit in the bridge pavilion and chat with friends is one of the most pleasurable experiences.